Please take a few moments to read and consider becoming involved in helping protect these unique creatures. The videos have not been imbedded in this posting. You can see them by linking to the original article. BLACKFISH SOUND, QUEEN CHARLOTTE STRAIT, B.C. Northern resident orcas like this one live primarily in the cleaner, quieter waters of northern Vancouver Island and Southeast Alaska, where there also are more fish to eat. They are the same animal as the southern residents that frequent Puget Sound, eating the same diet, and even sharing some of the same waters. They have similar family bonds and culture. The difference between them is us. 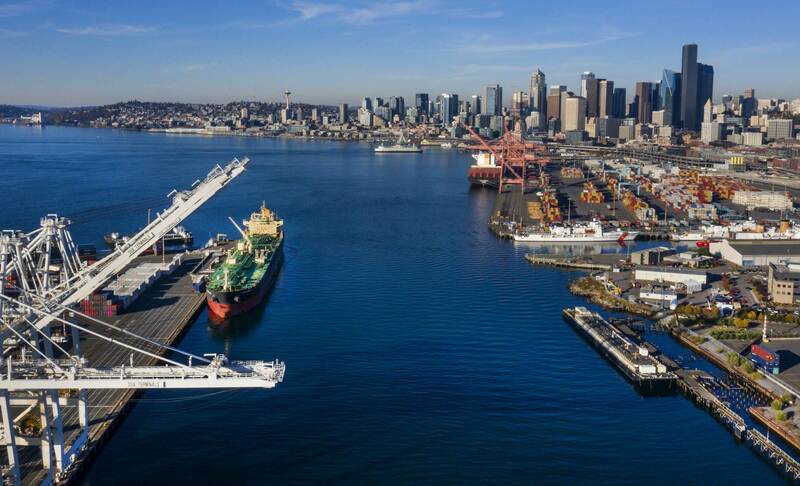 The southern residents are struggling to survive amid waters influenced by more than 6 million people, between Vancouver and Seattle, with pollution, habitat degradation and fishery declines. The plight of the southern residents has become grimly familiar as they slide toward extinction, with three more deaths just last summer. Telling was the sad journey of J35, or Tahlequah, traveling more than 1,000 miles for at least 17 days, clinging to her dead calf, which lived only one half-hour. In the weeks and months ahead, The Seattle Times’ “Hostile Waters” series will continue to explore and expose the plight of the southern resident killer whales, among the most-enduring symbols of our region and most-endangered animals. We’ll examine the role humans have played in their decline, what can be done about it and why it matters. Yet just to the north, the orca population has more than doubled to 309 whales since scientists started counting them in 1974, and has been growing ever since, at 2.2 percent per year on average. For scientists seeking to better understand the southern residents’ troubles, the northern residents are like a control group, said Sheila Thornton, chief killer-whale biologist for the Department of Fisheries and Oceans Canada. The decline of the whales, a symbol of the Northwest, is also a warning, as climate change and development remake our region. The northern residents live in not just a different place, but another world. aul Spong stuffs a pair of chainsaw ear muffs on his head to block out the racket as he pilots his boat to collect visitors arriving at OrcaLab, his remote, land-based whale research station on Hanson Island, on the northeast side of Vancouver Island.OrcaLab grows on the shore of the island like a huckleberry bush sprawling from an old-growth stump: organic and nestled into its place. And what a place it is. It’s a vision of the way the lands and waters of Puget Sound used to be. Behind the lab, a 1,000-year-old cedar reigns over woods in which the very light seems green. The ground underfoot is thick and soft with deep duff, and forest cloaks the land to the waterline. Beaches, never armored or walled off from the nourishing sea, are piled with driftwood and wrack. On these remote islands of the Broughton Archipelago, bears turn over rocks, looking for crabs, and ravens gronk in the woods. The jade green, clear, clean water is alive with seabirds, humpbacks and dolphins. Bones picked clean and wedged between beach stones attest to a bounty of fish. OrcaLab has been Spong’s listening post since 1970. 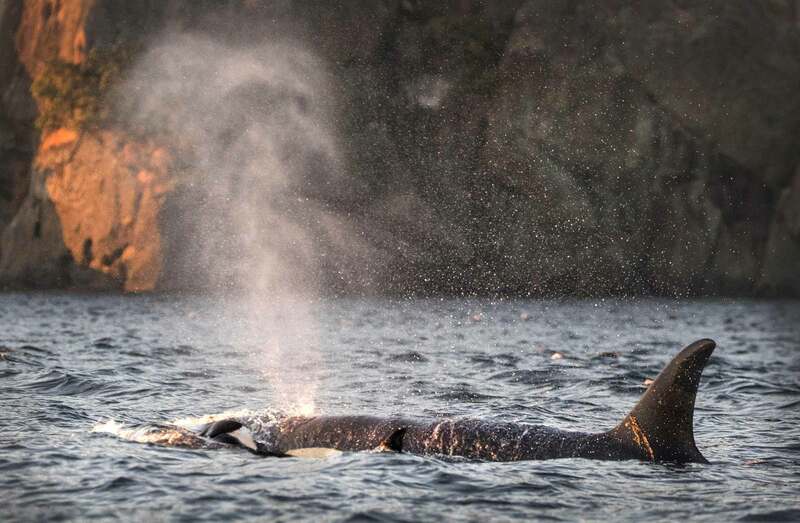 What he wants to hear — and has obsessively recorded 24 hours a day, seven days a week during summer and fall all those decades — are the sounds of the northern resident whales that cruise the waters of Blackfish Sound and Johnstone Strait. Leaning on a wooden rail of the deck overlooking the glassy water, Spong speaks softly of the life he and his wife, Helena Symonds, have lived here amid the whales. Behind him, inside his lab, an ever-changing cadre of research volunteers monitors feeds from underwater cameras Spong has placed throughout the area over the years to non-invasively document the lives of passing whales. Hydrophones — underwater microphones — also monitor the water from a listening network Spong has established over about 50 square kilometers in the orcas’ core habitat. Live webcams also bring the wonder of this place to the world. Among the first to understand the complex emotional lives and intelligence of orcas, Spong also was among the pioneers who insisted on a name change to orca from killer whale, to better reflect the nature of these animals that for so long were feared and maligned as random and vicious killers. Orcas are efficient and skilled hunters. But never in the wild has an orca been known to attack a human, even when captors took their young for aquariums. Trained as a brain scientist, it was while working with captive whale Skana at the Vancouver Aquarium in 1967 that Spong discovered he was interacting with a complex mind. It wasn’t long before he spoke out against captivity, earning his employer’s displeasure. After leaving the aquarium, he quickly established Orca­­Lab. By now he has logged thousands of hours of orca sounds and images and remains even more convinced that humans share space with beings that have capacities we are only beginning to discover. “They are so successful,” said Spong, reflecting on Orcinus orca, ruler of the seas and the top predator in every ocean of the world. They live in cooperative cultures and even in peace among different tribes of their own kind. 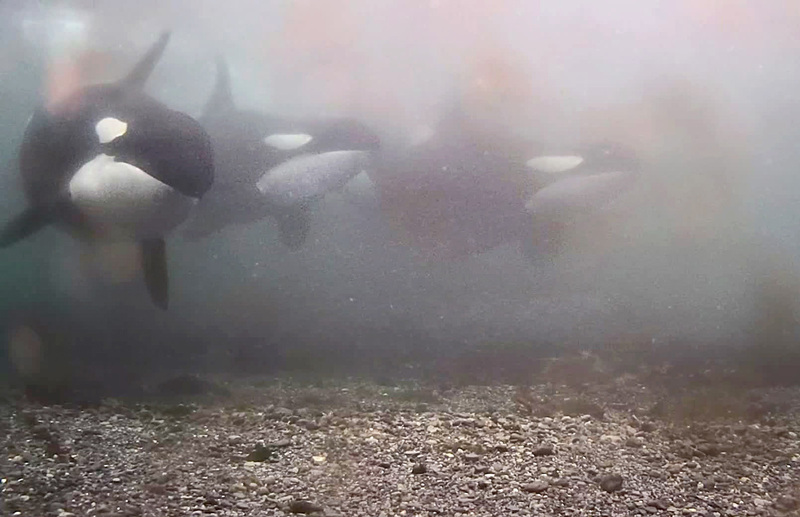 In the North Pacific, northern and southern resident orcas, transient orcas — or Bigg’s killer whales — and a third type called offshores have worked out a sophisticated diplomacy, sharing space over a vast territory. While they will overlap in their hunting and travels, they mostly each keep to their distinct ecological niches. 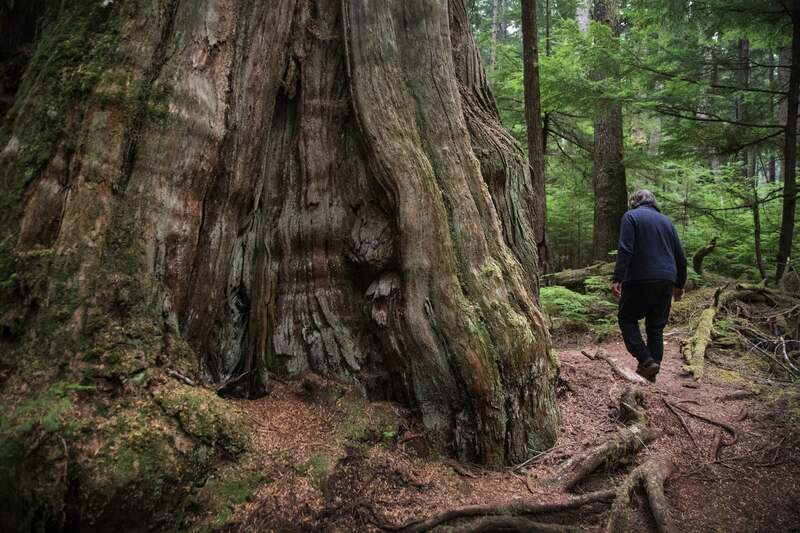 The northern residents generally keep to northern Vancouver Island and Southeast Alaska, while the southern residents ply the trans-boundary waters of the Salish Sea between the U.S. and Canada and outer coast of Washington, Oregon and even California. The transients travel both places and the offshores typically keep to the outer continental shelf. The three types don’t interbreed, don’t share language, food or culture, and are not known to fight. Specialization in diet might be one reason: The transients eat seals and other marine mammals; the offshores eat sharks, while the northern and southern residents eat fish, mostly chinook salmon. Killer whales are the most widely distributed whales in the world and found in every ocean. 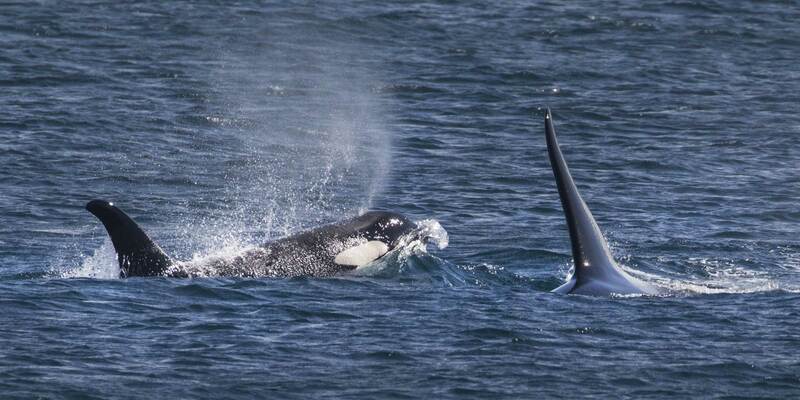 Three orca ecotypes reside in the waters of the northern Pacific Coast. While their ranges overlap, they are not known to interact, and each ecotype is genetically distinct. Explore a glossary of orca terms and our orca reading list. The residents are unique in their family ties, stronger than among humans. Orca families stay together for life, with the offspring never leaving the day-in, day-out company of their family. They share food, hunt and travel together, and sleep alongside one another, moving slowly with the current at the surface of the water. Conscious breathers, unlike us, they must keep half their brain awake to keep breathing as they rest. They are superheroes of the sea, traveling 75 miles a day and more, with bursts of speed up to 30 mph and capable of diving more than 3,000 feet. Yet they are so much more than all business. The northern and southern residents are playful, athletic and extremely tactile, continually touching and interacting in the water, with babies tossed by their parents and rolled over their backs. Their social lives are rich. Males and females can mate year-round. Spong shows underwater footage from cameras at Robson Bight (Michael Bigg) Ecological Reserve, set aside just for the whales. Here on beaches of round, smooth stones, they eagerly seek out their pleasures: The orcas slide through pellucid, aquamarine water, pressing the air in silvery bubbles from their lungs in order to sink low and scooch over the stones. They rub their bodies over the pebbles, seemingly just for the delight of it. You can text with us about this project and get additional coverage from the series. Text ORCA to 206-429-4613 to join the conversation. The sanctuary is visible from a remote OrcaLab observation outpost on Cracroft Point, with underwater cameras in fixed locations to serve as windows into the lives of the whales. 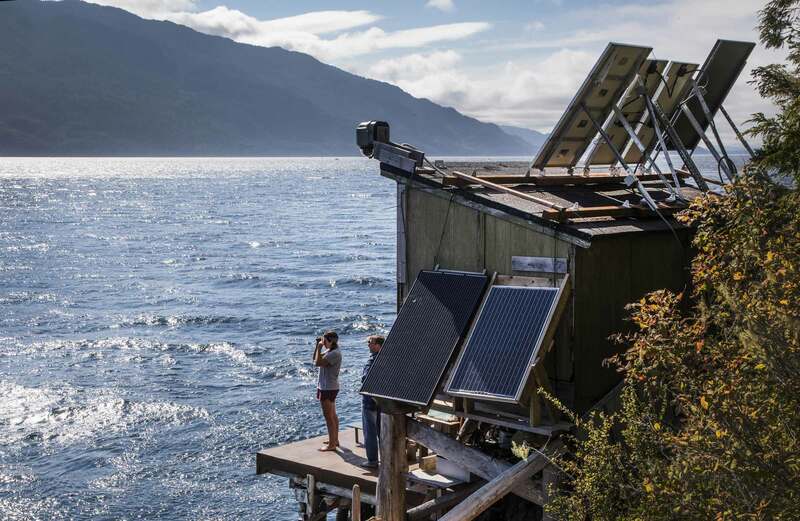 A shack atop a tiny platform on the point is the base camp for volunteers who also document the comings and goings of the whales and the human activities around them. Down the coast, more volunteers also are at work at the aptly named Eagle Eye Research Station. 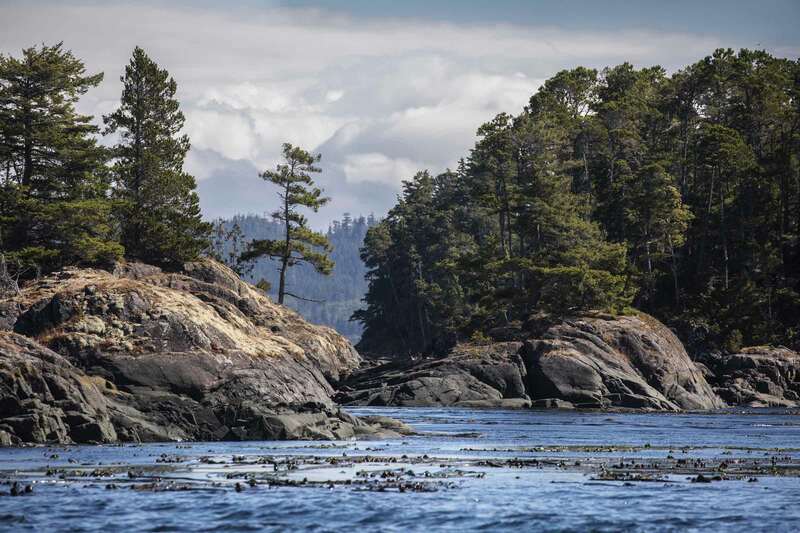 Reached with the help of a rope, climbed hand over hand up a steep cliff, volunteers here guard the reserve, established as a sanctuary just for killer whales in 1982 by the B.C. government. They keep an eye out for any boat — motorized or not — that might intrude on the whales’ peace and privacy, and they log whale sightings and boat activity. Marine wardens on patrol work to keep boaters the required 200-meter distance away from the whales outside the reserve, and guard the waters within it. The southern residents have no such respite or sanctuary from human intrusion and noise. 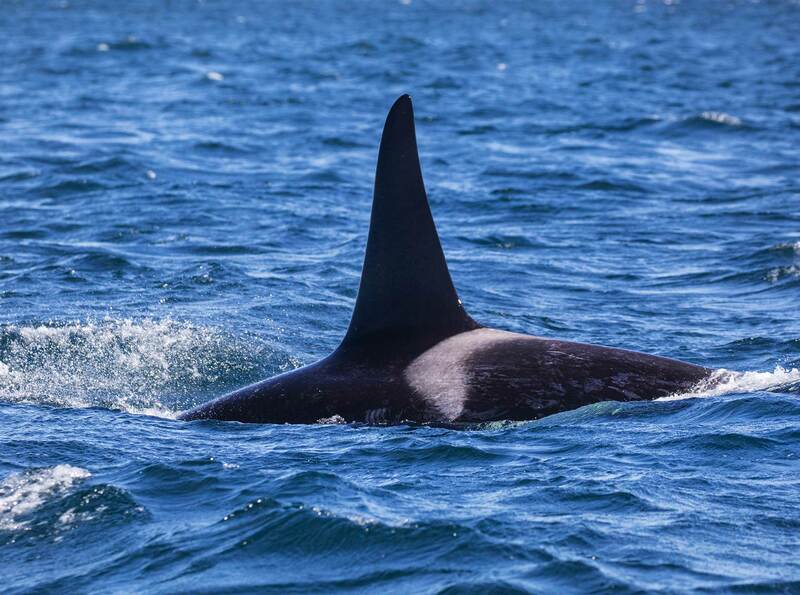 While they are the most studied whales in the world, and among the most endangered orcas, they contend with boat traffic and human intrusion even in their most critical foraging areas, such as the west side of San Juan Island. The northern residents’ sanctuary, set aside for feeding, socializing and enjoying the rubbing beaches, isn’t perfect. 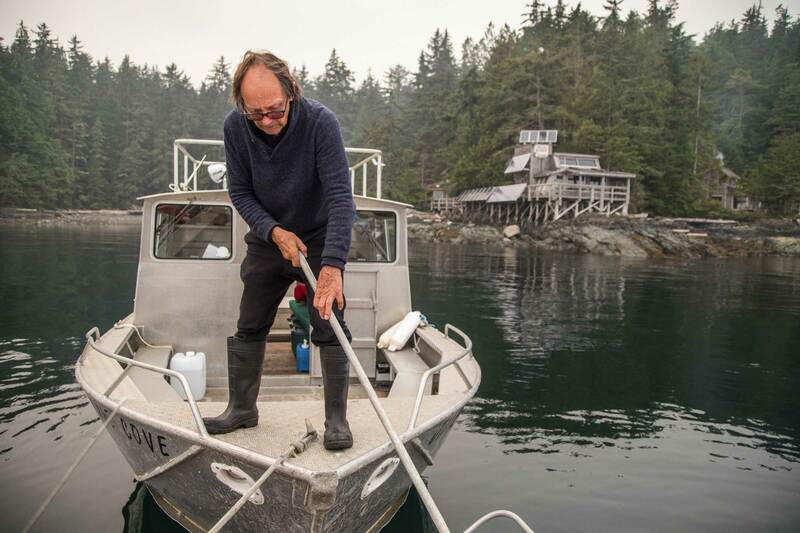 Commercial fishermen are allowed into the sanctuary to pursue sockeye. And adjoining Johnstone Strait remains a major connecting waterway between the waters of Southeast Alaska and the Salish Sea. Sure enough: A cruise ship suddenly comes into view, five stories high, blocking sight of the glittering waters of the strait. It seems spectacularly out of place, an emissary from the lands and waters to the south — where, amid millions of people, the southern residents try to live and cope. t was these hostile waters through which Tahlequah swam, carrying her sad burden day after day. She swam south of Vancouver, past the coal docks piled high and ghosting black dust into the water. 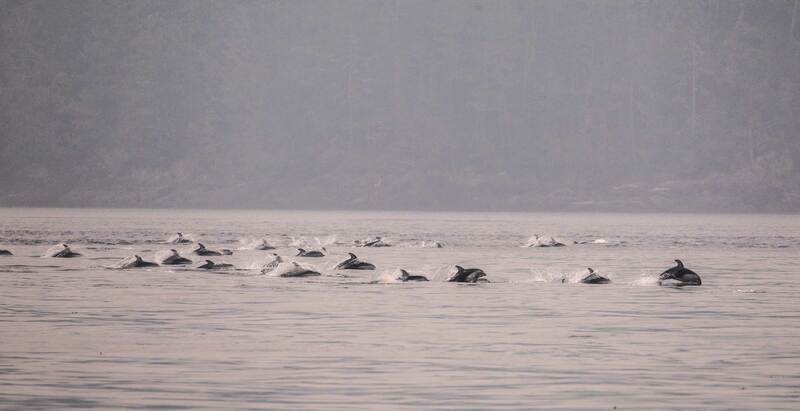 She swam through busy shipping lanes in Haro Strait, amid oceangoing container ships and oil tankers towering over her. 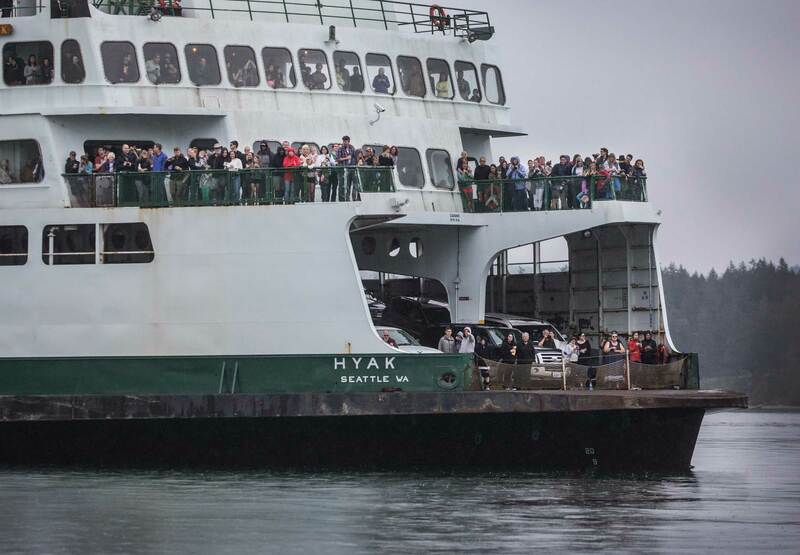 She swam through busy boat traffic, including commercial whale-watch boats that make millions of dollars every season. Vessel noise masks the sounds the orcas use to find their food, adding to their troubles.She and her family contend with other threats to their survival too: toxics that seep into the food chain, then into whale mothers’ milk. A recent study predicted a global killer-whale population collapse because of polychlorinated biphenyls, or PCBs, in the orcas’ food chain. A group of toxic, man-made chemicals, PCBs were banned from manufacture in the U.S. in 1979, but are still ubiquitous in the environment. PCBs were used around the world for decades, primarily to insulate and cool electrical equipment and prevent electrical fires. They were also used in hydraulic systems, lighting and cable insulation, paint, caulking, sealants, inks and lubricants. Today PCBs still leach, leak, dissipate into the atmosphere and contaminate runoff during rainfall. 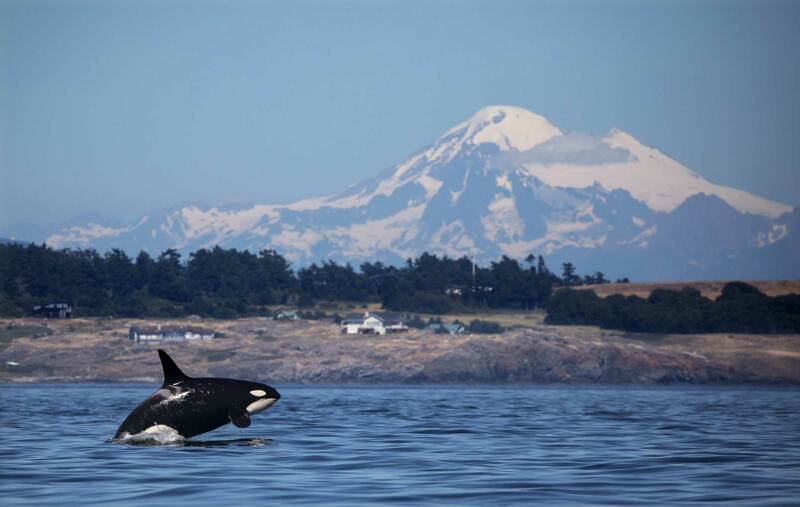 Southern residents are at more grave risk of health effects from PCBs and other toxics than the northern orcas, the study found, because the southern residents live in more polluted waters. Toxics also are more dangerous for them because they don’t have enough to eat. When they go hungry, orcas burn their fat, releasing toxics into their bloodstream. And too often the southern residents do go hungry because the chinook salmon they eat are threatened with extinction, just like them. 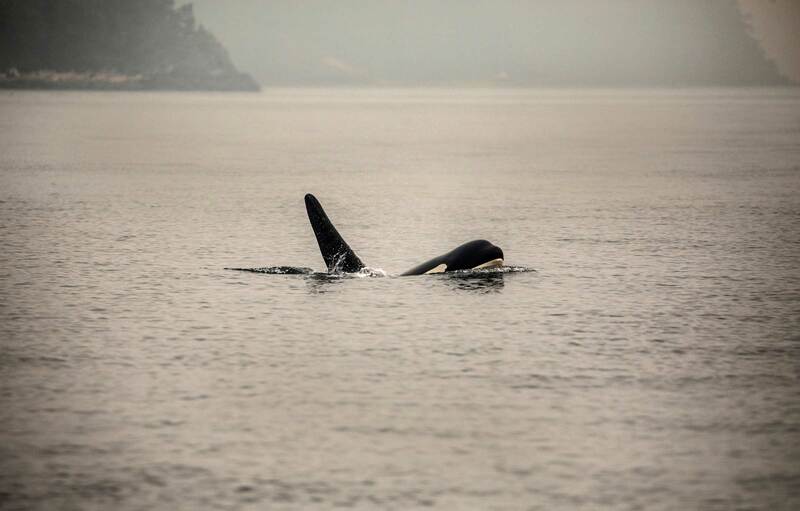 Tahlequah swam alone, her pod in hearing distance but not in sight. 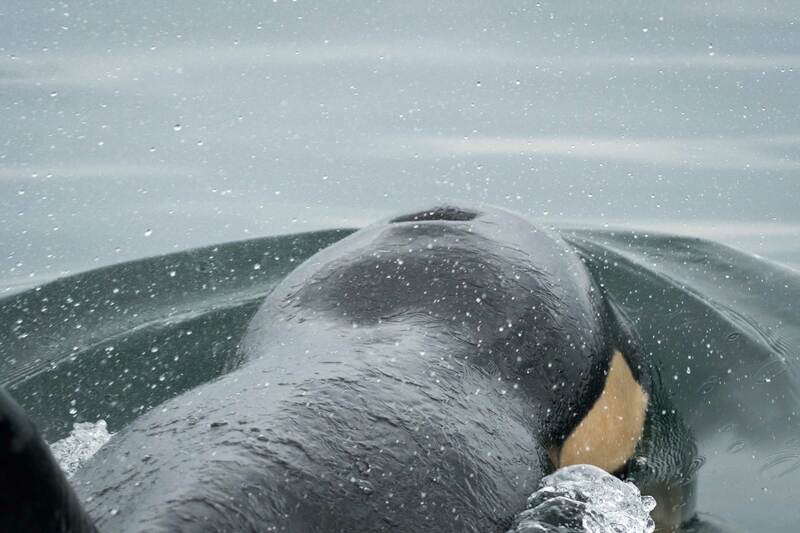 She swam slowly, perhaps with exhaustion, and her dives shortened in their arc as she worked to hold on to her calf. Despite the sunset light, glowing on the rocks in Swanson Channel on an evening in July, this was not that typical orca postcard photo, but the searing sight of an animal struggling to hang on in a battle with extinction. To be sure, the northern residents are still a threatened species, and have troubles of their own. 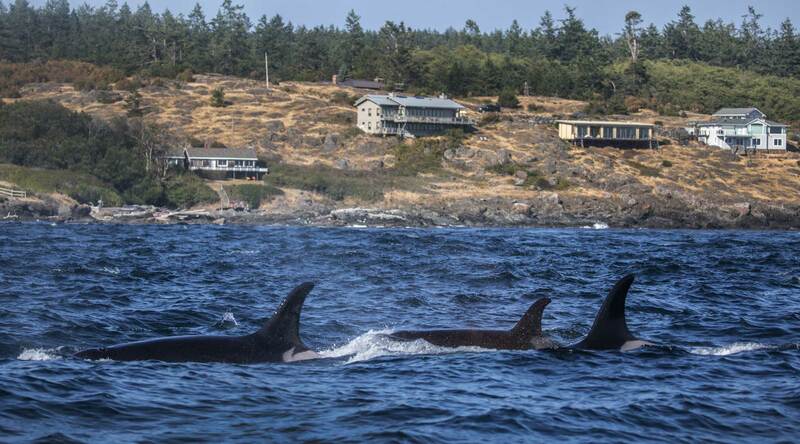 But the southern residents always have had the short end of the stick, said Jared Towers, a killer-whale expert with Fisheries and Oceans Canada who has studied both populations. 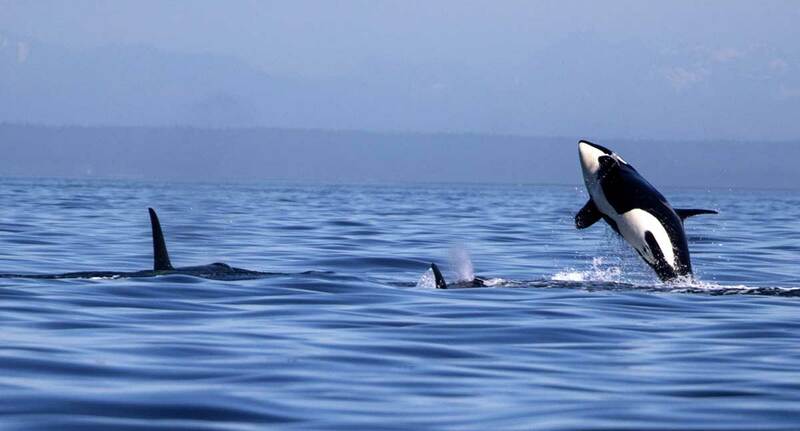 Northern resident orcas have a far more diverse array of salmon runs from which to choose, including Washington-spawned chinook as those salmon mature and travel in northern waters. They pick them off before the southern residents ever get their chance. But for thousands of years, the southern residents still thrived until their habitat and food supply were diminished. The main limiting factors for the southern residents are the reduction of the quality of their habitat and inadequate food within their primary range, Towers said. The southern residents’ short end of the stick is getting shorter as they struggle in some of the most urban waters for their kind anywhere in the world. The southern residents today are critically endangered, with only 74 left. In response, Gov. Jay Inslee has convened a task force on orca recovery, meeting now to devise recommendations due Nov. 16 for this legislative session. Whether those efforts will result in the far-reaching changes the orcas need — from cleaner water to quieter foraging and more chinook — is yet to be seen. As winter looms, scientists’ drone photography shows several of the southern residents are looking thinner than they were at the start of their seasonal year in the Salish Sea — a bad way to start the leanest season of all. There is hope in at least three pregnancies in the southern resident pods, J, K and L. However, that hope is fragile. Of 35 pregnancies among whales tracked by University of Washington scientists from 2007 to 2014, more than two-thirds failed to produce a live calf. And the losses were probably higher; not every pregnancy is detected. Struggling to survive in hostile waters, the southern residents have not successfully reproduced in three years.